I think Queen of Shadows is my favorite book in this series. So far. I just really enjoyed this one even though I had to take a break from it for a while. It was a much needed break. 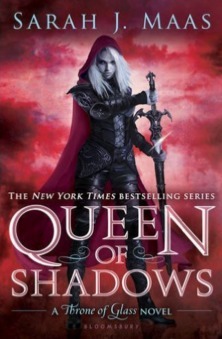 I felt as if I was getting tired of this series and that’s the last thing I want from a book by Sarah J. Maas. I’m really excited where everything is beginning to go in this series. I feel like so much has happened in this almost 650 page book. I was just in awe of everything. And that last chapter of Aelin going home really just opened my heart. I really love Aelin’s growth in each of these books. But this one is the best. She addresses herself as Queen and I adore it. I just love that she fits so perfectly in her role as a leader and you see that throughout this entire book. I can’t wait to see her leading her people in battle. It’s going to be so freaking amazing. I also can’t wait to see her and Rowan’s relationship blossom. Sarah, if you do anything to hurt Rowan, I will personally fight you. I hated Chaol throughout this entire book. I wanted him to get shot in the eye by an arrow. Nesryn’s arrow to be exact. He was pretty dickish to her and he would have deserved it so much. He redeemed himself a little bit at the end, but I still really can’t stand him right now. I’m so glad that Dorian is back. I just really missed his genuine character. I’m sad for him and happy at the same time. He lost someone he loved but I feel as if he might gain a new love in the future. I’m so happy that he landed that killing blow. Good for him. All in all, I really freaking loved this book. There were new characters and there were old characters that I didn’t think we’d see again. There was so much action and so much love. I cannot wait to see what happens with Aelin and her cadre in the future.